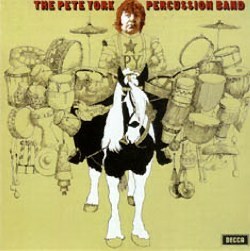 PETE YORK PERCUSSION BAND CD FINALLY OUT! The long-awaited Pete York Percussion Band CD is finally out, released, expelled, escaped, whichever way you like to look at it. The story behind this release of a long-lost radio broadcast is a tale of mystery and intrigue. There were various line-ups of the so-called Pete York Percussion Band and one incarnation grew out of some legendary sessions performed at a pub called “The Bath” in Shearsby, Leicestershire. I used to drive up there and sit in with a wonderful bunch of mad musicians led by Steve Fearn. The music was the most eclectic mix I’ve ever played, ranging from Rock to Jazz to the Classics. And these guys could play it all. What made it worth the long trip and a five pound fee was the comedy. The whole evening was a riot. be fired and the band would race through the audience to the stage, grab their instruments and start to play as fast as possible. First on the stage was the first to start blowing. A chequered flag would signal the winner, possibly the clarinet in a time of 51.75 secs. Various Strausses, Richard, Johann, Clint and Britney would spin in their graves. I used to tell my other pals in the Deep South of the Thames Valley about all this fun and one weekend Jon Lord and Ian Paice drove up to join the mayhem. There was a hot time in old Shearsby that night when half of Deep Purple showed up. Word got out and we were offered a BBC “In Concert” broadcast by one of the most imaginative BBC producers, Jeff Griffin. That was back in 1973 and for more than thirty years this recording has been almost unheard. About five years ago I was in Tokyo with Spencer Davis and a young fan asked me to sign a CD which turned out to be an illegal pressing of this broadcast. Determined, I combed the notorious Skrinja District of Tokyo and found the Do Dji Lecord Shop. The proprietor, a Mister Elvis Yakamoto, was happy to sell me a copy of my own record for the price of a small Mercedes. the members of Steve Fearn’s band all playing live to an audience in Finchley. Finchley’s finest hour, as the “Chicken Fancier’s Gazette” review put it so kindly.